It's Angela here and I can't believe another month of 2012 has flown by. With another month coming to an end, that also means that my time as the Guest Designer here at Eclectic Paperie is also coming to an end. 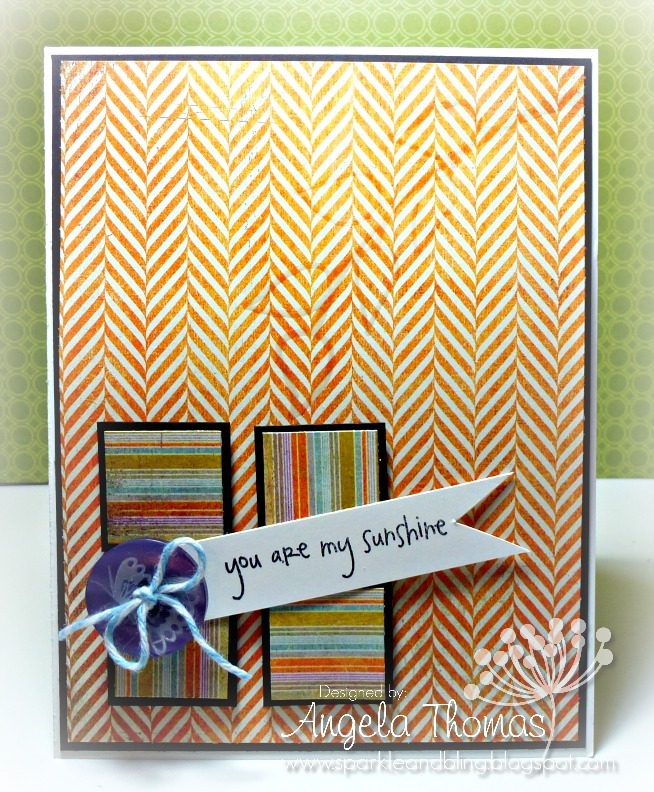 For my card today, I went clean and relatively simple using the current Sweet Sunday Sketch challenge. I used two different stamp sets on my card today - one being my fave set I've used this month from Market Street Stamps called "Growth" and the other being a Wplus9 set called "The Birds and the Bees". I stamped one of the leave images from the Growth set in Versamark and then embossed it with Ranger Superfine clear embossing powder. The sentiment was stamped in Memento Tuxedo Black. The DP I've used is from Basic Grey and is called Plumeria and the buttons are also Basic Grey Plumeria Vintage Buttons. I've attached some Twinery "Shore" twine to the button. Darling card Angela! It's been a delight to have you with us this month!! Thank you! What a lovely patterned card! Thanks for your sweet comment... I love your card...I always admire cards but never seem to make them...only when I need to give one away...then I make one..so I do not have a stash..I also like your previous posts! Love your card. I have a hard time using patterned paper and I love how this CAS turned out.